The Visiting Noble is a Nord warrior who is spawned in the main dining area of Dragonsreach in Whiterun if chosen as the target of a contract for the quest The Dark Brotherhood Forever. The Visiting Noble is one of ten potential targets who can be chosen by the radiant quest system. He will rudely brush you aside with "Would it kill you to let a man go about his business in peace? 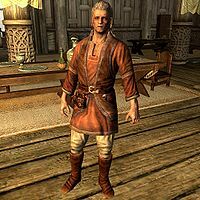 Really, the nerve..."
The Visiting Noble wears merchant clothes along with a pair of boots. He carries a leveled dagger for protection. This NPC typically will move around the more heavily populated dining area where attempting to kill him will most likely incur a bounty. However, there are instances where he enters the cooking area opposite Farengar Secret-Fire's quarters. This offers a greater opportunity to sneak attack the Visiting Noble without incurring a bounty, as there will be a lower likelihood of the presence of other NPCs in the area. This page was last modified on 21 November 2013, at 18:09.